Chinese Baseball: And NEW 2015 CBL Champion, Jiangsu Pegasus! Well, there you have it! It's August and the 2015 CBL season is already over. The winner of this series in the result of a sweep, and NEWWWWW champion, The Jiangsu Pegasus. 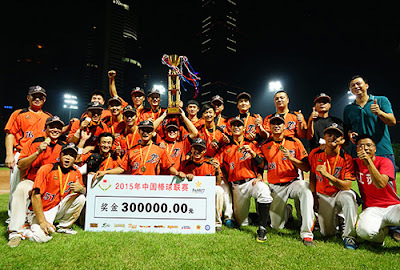 After beating the Beijing Tigers Friday 6-5 in extra innings, they won in dramatic fashion yesterday with a come from behind victory 4-1. This is the first title Jiangsu has ever won after being such a lousy team for so long. Congratulations! Anyway, there you have it. Thanks for reading the short update! More to come! More developmental players!! !